Old school. That's how I would describe Larry King. It's a case of "been there, done that, got the t-shirt, sent the postcard, drank the wine, got on the bus and came home" for me. It's simple: the older you are, the more you've seen and done, the more you've lived, and therefore you're just "more". There's "more" to the man we all know from his radio and television shows, and his book is a wonderful story of how Larry Zeiger from Brooklyn became Larry King, known around the world. His book is full of funny stories from his childhood, thoughts, influences, pranks, dreams, jobs, his career and more. King tells of his start in radio in Miami and of many of the people he met. He talks briefly of his many marriages, at some length about his children, his move to CNN, and his quintuple bypass surgery. It would be impractical to list all of King's interviews, or talk about them all, but he does mention a few memorable ones: O.J. Simpson, Tammy Faye and Jim Bakker, Sinatra, the presidents he's interviewed and known, and sports personalities and anyone else you can imagine in the spotlight or not. 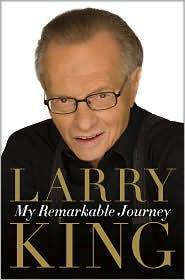 Mr. King founded the Larry King Cardiac Foundation which helps those who need heart surgery and cannot afford it. A noble cause - I wish we all could help each other every day, any way we can. Thank you for the eloquent "explanation" about gay people. Thanks too, to that Korean soldier whose explanation it was. I also completely agree with Mr. King's comment on NASCAR. Conclusion - Humorous, enlightening gracious, and encouraging. Website design and © Adrienne Petterson 2003-2009.